Blister beetles attacking Swiss chard in my kitchen garden. For more about how to deal with blister beetles—and the many ways we use diatomaceous earth around the farm—check out this post. I knew better, I really did. Translation: I am a lazy gardening idiot. There are several things that I block out each year once they're over, like lambing season, which is very cute but stressful and totally exhausting. Poisonous snake season. Chiggers and ticks and the unsightly, horribly itchy ankles they cause. Hot and humid Missouri summers that often last five months. So when I saw a couple of blister beetles, which love hot, dry weather, trotting along the burned up grass near the sheep barn the other day, what did I do? Nothing. What should I have done? Raced back to the garden and liberally doused the pepper plants, tomato plants, and Swiss chard, as well as the surrounding soil, with food grade diatomaceous earth (which we buy in economical 50-pound bags - it will last indefinitely if kept dry). These are the crops they seem to go after the most, although I know they also like beans. Yesterday morning I went out to the garden and discovered that the ravenous blister beetles had arrived just in time for my birthday. 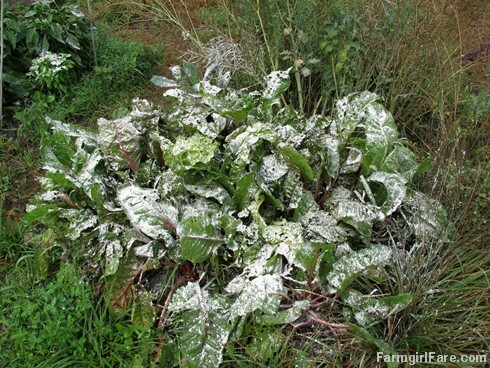 The 4'x4' patch of densely planted, previously beautiful Swiss chard was teeming with them—and the leaves that hadn't been devoured were covered with their disgusting droppings. I found minor damage on a few tomato plants too. I tossed handfuls of diatomaceous earth all over the chard leaves, and then sprinkled some around all the tomato and pepper plants, along with the eggplants just in case, and then went back inside to block out the depressing invasion and have some cake. And then I got my birthday wish and it rained—and washed away all of the diatomaceous earth I'd just put out. Even though I'd said I wasn't going back outside for the rest of the day (Did I mention the two big pepper plants the deer decimated? And the two little flowering birthday perennials I'd just bought myself that were eaten down to nothing while sitting in the greenhouse? ), I went out last night and covered everything with DE again. 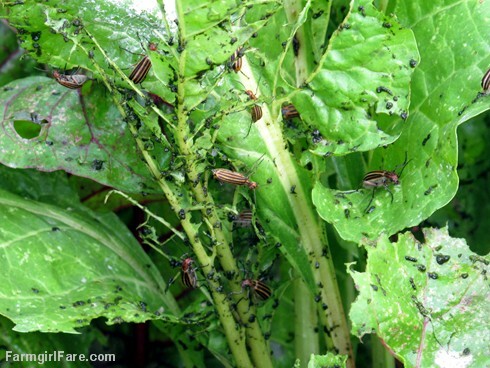 There were still quite a few blister beetles on the chard this morning, but they weren't moving very quickly. There was minor damage on a few nearby pepper and tomato plants, but not much—and I only saw a couple of beetles still on the plants. I had really good luck last year using DE against the blister beetles, so I think the trick is to put it on before you have a bad infestation. At this point I'm just trying to keep them on the Swiss chard, which is already history, and away from everything else. And if I cut the chard back to the ground once the beetles are gone, it should grow back, which is one of the reasons I love it so much. If I cut it back now so it looks more depressing, the beetles will likely move on to something else. For the last few years we've been drenching our sheep with a 50/50 mix of Garlic Barrier organic garlic juice and organic raw apple cider vinegar as a natural wormer and overall health tonic. The garlic juice is mainly used on agriculture crops, and I've been meaning to try it in the garden against various pests. What I should have done yesterday was spray the plants with garlic juice and then dusted them with the DE. If the blister beetles haven't retreated by tomorrow, that's what I'll do next. Last year a reader said she'd had good luck using organic spinosad spray on blister beetles, and I'm thinking about ordering some and trying it. It's supposed to work on lots of other garden pests too. I can't remember how long the blister beetles stick around, but they usually arrive after a particularly hot and dry spell. I do know I'm already looking forward to when I can once again block them out of my mind for another year. Do you have any tips or tricks for getting rid of blister beetles? © FarmgirlFare.com, where I just found a blister beetle crawling around on the kitchen floor. I think I need more birthday cake. Is it poor form to use a shotgun? Perhaps with a laser sight to avoid too much crop damage? I'm sorry. I don't mean to kid. They are awful monsters and deserve the DE dousing they got (are getting/will continue to get). Thanks for the reminder that we all have our gardening trials. Right now in Reno, we're dealing with 100+ temperatures and have had 2 inches of precipitation so far this year. NO rain since April. It costs me over $100 a month, just for water for the garden. BUT... the only bugs we have to deal with are earwigs, squash beetles, and sometimes crickets and grasshoppers. And the chickens are great for dealing with those. Good luck with your pests! Belated birthday love and hurrahs, dear lady! Happy belated birthday! We've seen an early and intense onslaught of pretty much every kind of beetle known to farms here in northeast Ohio. It's super dry and super hot. At the farm where I work part-time, we were harvesting green beans yesterday and discovered that the Mexican bean beetles had discovered the patch. Farmer Ami howled and added 'spray neem mix' to her long list of sunset activities. Hope your chard pulls out of it OK - maybe throw some more chard seed in another bed now, just in case? I trust birthday/beetle recovery is going well. You deserve more cake and a pre-birthday memory plan for next year to remember the DE. 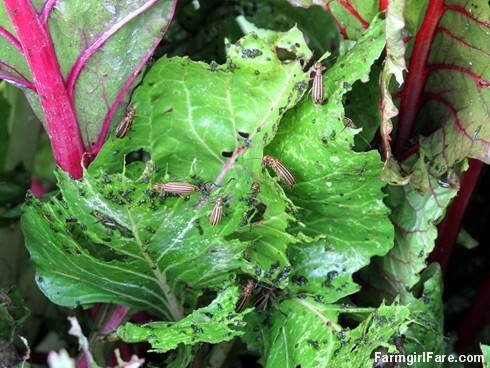 Chard will revive once the beetles have had their "moment?" and gone to their reward - snarl. Wishing you many happy birthdays but no returns of beetle day...ever. Oh boy, I can relate. I've never seen a blister beetle, but with me it's harlequin beetles. Beautiful things, but boy can they rip through your brassicas. I once had them so bad on my brussels sprouts that it looked like a horror movie! Hang in there! Be careful spraying with Spinosad. While it is organic it organically kills bees as well as what you want it to kill. If you must use do very early or late in the day to avoid bees. If DE will kill what you want kill use it instead. I use Spinosad in the form of Sluggo Plus pellets to kill snails and sow bugs but not a spray format. It is reassuring to hear that others have many of the same frustrations I do as an organic gardener. The blister beetles are chomping away on my tomatoes. Luckily, I planted plenty so I'm hoping there's enough to share. I also am scared to use DE (although I have used it in the past) because it kills some "good bugs." Have any of you read the article in Mother Earth News magazine by Harvey Ussery who writes about trying to attract lots of beneficials to deal with the bad bugs? Is there a natural predator of the blister beetle? Ugh! Blister beetles! (And happy birthday!) I saw one in the garden last week, but then it started to rain and has rained a bit daily and I haven't seen another..yet. I have Spinosad, but haven't used it yet and have found DE to do nothing to deter them..at all. In the past years I ahve found one way to get rid of them that works very well, but it is nasty. The first day you go and gather as many blister beetles as you can find up into a cup of lightly soapy water. Carefully so as not to get yourself blistered. Then throw them in a blender and hit puree. Strain off the buggy bits and you are left with a bug tea, as it were. Dilute it with more water and spray your garden with the blister beetle tea and they go away and leave your garden whole. It really, really works. But if someone did that with people and the grocery store, it would work for me as well..
Good luck with the blister beetles.We don't have them here in Ireland, I'm just suffering slug damage instead. Lost my whole pumpkin crop to them. However I'm a bit like you, I should learn from one year to the next and be ready. truth is I wait for a problem to happen, then I fix it. but if these wet summers continue I'll have to think again. Lovin your blog by the way,I was brought up on Little House on the Prairie, you are my 'little house ' fix. P.S. Just love Out of Africa and Flame trees of Thika too.